This week, you get to take a bite of a delicious ham sandwich because we welcome Gary’s better half to the show – Greg Ham! We discuss a variety of topics: April Fools pranks, blind box woes, collecting habits, Funko secret santa, twin perks, how Greg got into art and animation, who the heck is Guggimon, and more. Another week, another round of toy talk! We chat on the upcoming Shanghai Toy Show, tiny toys, some exciting news for Thimblestump Hollow, and more. Cut! Uncut! This week, the gang gets together for some good old-fashioned toy talk and discuss toy news and happenings in the scene. We cover Toycon UK, recent gallery shows and releases, and various leaks and sneaks. Links to all the goodies discussed below. This week, Cory of Strange Cat Toys makes his return and this time round we let him speak. We talk how Strange Cat began, challenges faced, expanding reach and inventory, Misappropriated Icon 2 show, producing toys, and more. Jess joins for a live reaction to some toys. This week, we welcome Chris Lee aka “The Beast is Back” to the show. We dig into Chris’s early days in designer toys, recent toy creations, Dunny's with Kidrobot, freelance life, toy collecting, thoughts on pop culture art, and more. This week, George is back! We do a bit of catchup then jump into the toy talk. Topics include: Glow in the dark toys, Popmart product overload, preorder and silent auction sales approach, sellout hype, promotional propaganda, insider clubs, and more. 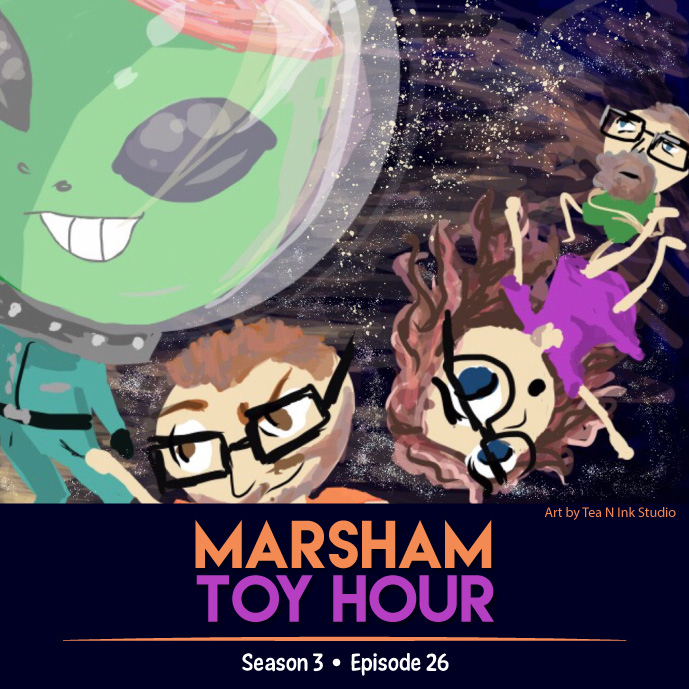 Marsham Toy Hour: Season 3 Ep 39 - That’s a Wrap! This week, Gary and Theresa wrap up Season 3. We cover some recent toy news – sharing thoughts on the Superplastic Janky series, Unbox Industries’ new blind box mini series, and Toy Soul coverage and releases. Then, we pull in Horrible Adorables for some 2018 reflections and 2019 wishes and predictions. Happy Holidays! Be back in January for Season 4! This week, we welcome Don “Datadub” Kratzer back to the show. He joins us for a mini episode to discuss a variety of topics – Tokyo Comic Con, patriotic colorways, Martian Toys designer toy world cup, studio visits and popup shops, toy history, recent toy excitement, mixing of eastern and western artists, and more. This week, Gary and Theresa turn the tables on George and make him the guest of the show! Join us as we get to know George a little more – chatting about how he got into the world of toys, companies he’s worked with, adventures with little George and Rob Zombie, creating October Toys and Toy Break, collecting habits, and more. This week, the gang gets together for a Designer Con wrap up! Join us as we discuss the good, the bad, and everything in between. We share thoughts on the new location, VIP night, venue size, and more. This week, we welcome Andrew Bell back to the show for some pre-Designer Con talk. We hear Andrew’s take on his intolerant lacto’s release, learn what other goodies he’ll have available at the show, chat about licensed releases at Dcon, share what we’re looking forward to seeing, and more. We also get George and Andrew’s opinions on a few topics discussed last week. Designer Con, here we come! See you all there! This week, Gary and Theresa hold down the fort for minisode #4. Might as well toss the buzzer out the window at this point, but hey, we’re trying! We discuss some interesting Designer Con teasers from Andrew Bell and question the need for licensed dinosaur toys. Other topics include toy collaborations in Asia, ComplexCon, and continued discussion on seasonal toys. This week, we welcome James Groman (aka Jim) back to the show! Discussions include: nerdy sculpting talk, being a cool dad, his relationship with Instinctoy, Kaiju Killer and upcoming projects, thoughts on Taipei Toy Festival, freelance work, and much, much more. It’s minisode #3! We may be bad at obeying the buzzer, but this mini episode is packed full of fun. Join the gang for discussions on seasonal toys, leaked news, FYE presence at Designer Con, SpongeBob licensed products, Kaws plush, and Taipei Toy Festival. Sponsor: MyPlasticHeart (use code "toyfam" to receive free shipping within the USA on orders of $75 or more. This week, Gary, George, and Theresa welcome back collector Katherine Park to the show. We cover an assortment of topics from Designer Con and Broke Piggy to Googlers and Android collectibles to Re-Ment and gashapons. This week, the gang is back for an attempt at minisode #2 – our new faster paced format with timed topics. Discussions include: Martian Toys Dero custom show, Kidrobot nixing preorders, POP by Footlocker, cultural toys, shelf life of a toy, and more. Gary also introduces a new game called Designer Toy Challenge! We maaaayyyy have been a bit lax on the timer rules this time Listen in! This week, Dan Willett of Unbox Industries joins Gary and Theresa to dig into the ins and outs of the Unbox brand. We discuss how Unbox came to be, production processes, how they work with artists, their toy event presence, upcoming releases, and so much more. This week, Gary, George, and Theresa try out a new format, called minisodes, where we cover a variety of topics in a short amount of time. Only 3 minutes per topic so buckle up and get ready for discussions at warp speed. Topics include Superplastic Janky updates, the new Kidrobot Munny packaging, Designer Con Dunny reveals, toy anxiety, and more. Listen in before *buzz* times up! This week, Science Patrol joins us to drop tons of knowledge on the production of sofubi in Japan. We get super nerdy discussing all the ins and out of the world of sofubi - the factory setups, creation process, materials, advice for getting a sofubi toy made, and much more. It’s jammed packed with details so listen in! This week, the gang's all here and the newlyweds are in full effect! Things to look forward to are: Tales of going Gaspar, Gary gets in trouble....again, Leaks and Sneaks, expectations vs. reality, pre-ordering, cancelling and returns, DCon concerns, and more. This week, we've got a lot on the menu as Sket One joins Gary and Theresa to discuss his 14 years designing for toys. We cover a variety of topics including: Sket's early days in toys, the different stages of the industry he's experienced, multi-casting from a platform, IP conflicts, reverse licensing, quality of self produced resin versus production vinyl, and much more. This week, Nick Aliota, a Funatic and designer toy collector joins Gary and Theresa for a yet another Collector's Edition. We discuss the difference in communities, tuning out the negative side of collecting, procuring older toys, DCon expectations, the power of hype and the panic of spontaneous drops, reselling, competing with bots for purchases, lotteries, more box talk, and so much more. This episode is packed! This week, we finally wrangled Ben Goretsky back to the show to get the latest scoop on Designer Con and boy was it worth the wait! Did he say more than tripled in size? Pavillions? Medicom? Funko? This is an episode you won't want to miss! This week, it's the regular crew - Gary, Theresa, and George (with a touch of Jess) - chatting it up on a variety of topics including SDCC, tattoos, bootlegs, common toy themes, licensed toys, and more! This week, the super talented Seriously Silly K joins Gary in a ping pong discussion of fun. We talked toys, sculpting tips and tricks, projects, culture differences, wood working, twinning and much more. Silly also comes prepared with questions for both Gary and the listeners. This week, our guest called in sick last minute, so Gary, George, and Theresa rummage through a series of topic like toy documentaries, the DTA's, the impact and reach of Superplastic's Kickstarter, hypothetical scenarios and more. This week, Cory Rutter from Strange Cat Toys joins Gary and Theresa to wrap up all things Five Points Festival and the Designer Toy Awards. We compare the DTA winners to our prediction pool results and share our experiences and thoughts on Five Points weekend. Marsham Toy Hour: Season 3 Ep 17 - Game Night!!! It's a full house this week! Gary, George, and Theresa are joined by Jess and Horrible Adorables for a laughter filled second edition of game night! We kick off the episode with some sneak peeks, get reacquainted with Horrible Adorables, and then spring into a fun night of games - "Which is the Toy? ", "Toy Gabs", and "Toy Synonyms". See you all at Five Points! 2: That Tyke, Ron Nickel! 12: Cent He; Echo Come Mack on! 17: Syria slice; Ill EEK aye! This week, Gary and Theresa are joined by the rambunctious Five Points Fest gang - Josh and Miranda Kimberg and Sarah Booz - to talk all things Five Points Festival. They cover everything from Designer Toy Awards to food and beer to special guests and show exclusives. If you're looking for the deets, we've got them! This week, Gary chats it up with arts and crafts professional and co-founder of Hi-Fructose Magazine, Attaboy. They discuss Atta's early days of designing and producing toys, the crossover of designer toys in relation to the contemporary art scene, and a bunch of other happy little topics. Anyhoo, it's Attaboy. He's interesting. He's fun! This week, Gary and George are joined by Munky King Founder, Patrick Lam. Patrick shares stories of Munky King's journey from it's early beginnings to their new direction of politically charged toys with their latest release , The Messenger. Other things discussed are : Munky King helping to further the design community with a communal working space, American versus Asian toy culture, Super Cooper, SuperPlastic's Janky, platform toys, Gary's new word, Munky King's epic SDCC parties, conventions, and more. A new segment, "The Outsider's Opinion", with Jessica is introduced. Join Marsham Toy Hour's Facebook Community "The Stomping Ground"